Security Update. Starting from NatNet 3.0, the NatNet library will strictly work only with Motive. This means the new versions of NatNet and other OptiTrack streaming plugins will no longer work with server applications other than Motive, such as Arena and Tracking tools. Remote Configuration of Motive. Additional remote commands have been added. Now, you can use the SendMessageAndWait command to remotely configure the settings on the server (Motive) side. Latency Metrics. Latency measurements have been greatly improved. Now, NatNet can query timestamps from specific points from the processing pipeline. Refer to Latency Measurements page for more information. NatNetServer class deprecated. The NatNetServer class is deprecated and no longer supported. Use Motive / Motive API to build the server application instead. Auto-detection of the server address. Now NatNet clients can make series of attempts to look up DNS address of the available server. Additional Projects: Additional projects have been added to the samples folder. Rebroadcast Frame Data: Serial port streaming example. RebroadcastMotiveData. SampleClientML: Sample command console application utilizing the managed library. Minor changes on the data structure. 3D positions of the rigid body model markers have been moved from the frame data onto description packet. You can utilize the position offset data given for each rigid body model marker and combine it with per-frame rigid body position and orientation data to derive the model markers instead. GetLastFrameOfData function GetLastFrameOfData method has been deprecated and no longer supported by Motive 2.0 or above. Please poll the data from a data callback function instead. Skeleton Bone Descriptions. Skeleton bone data description packet has been changed from left-handed convention to the right-handed convention to be consistent with the convention used in all other data packets. 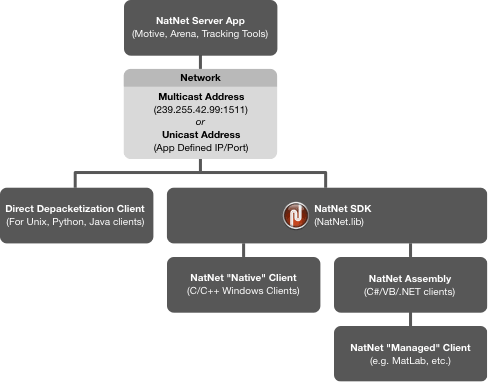 For older versions of NatNet clients, the server, Motive, will detect the client version and stream out skeleton data in the matching convention. This change will only affect direct-depacketization clients as well as clients that have the NatNet library upgraded to 3.0 from previous versions. This page was last modified on 19 March 2018, at 13:15.